A West Texas “welcome” is the friendliest greeting in the whole world; and Pecos is as “West Texas” as it gets! To receive a Pecos welcome, just stop! Stop at the excellent park and zoo, at the authentic frontier hotel that's now a museum. Stop anywhere in the town of Pecos - but first stop at the Chamber of Commerce for details and information; on Cedar Street (US 285) near First Street. said Bill died from laughing- "at the dudes who call themselves cowboys." Pecos Bill would have taken all the prizes if he'd been on a dusty street in Pecos back in 1883. As it was, cowboys from rival ranches competed for the prizes and bragging rights in what Pecos claims was the world's first rodeo. Although other towns dispute that claim, the fact remains that in July 1883 Trav Windham, foreman of the Lazy Y, won a $40 prize for roping and tying his steer in 22 seconds in the middle of Oak Street - the same Trav Windham who was still leading rodeo parades in the 1930s! You're the lucky visitor if you're in Pecos around July 4th - that's rodeo time at the granddaddy of 'em all! In the rolling-to-mountainous 2,600 square miles that make up Reeves County, ranches here average 15,000 arid acres. World-famous Pecos cantaloupes grow here, too. To the southwest gush the San Solomon Springs in the fertile fields of Madera Valley. The land slopes from the Davis Mountains in the southwest to the county's northeastern boundary - the Pecos River. To the north near the New Mexico line is Red Bluff Lake, an impoundment of the Pecos. 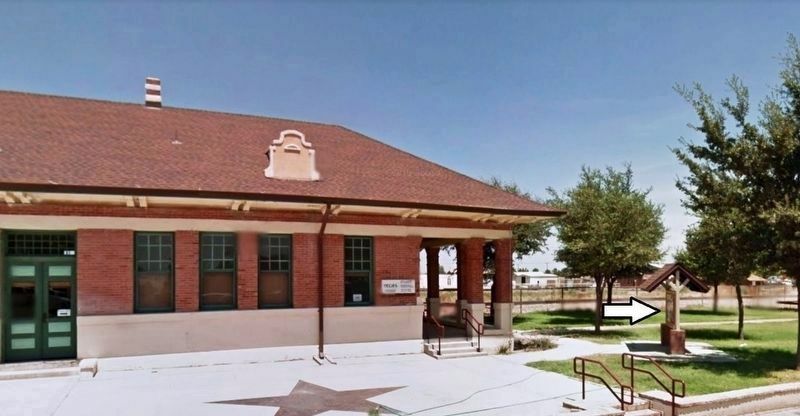 In 1881 workers pushed the steel rails of the Texas & Pacific across Reeves County, leaving a stop named Pecos Station on the banks of the Pecos River. Pecos Callahan, son of the railway agent who doubled as postmaster, was the first white child born here in the lawless years. "Pecosin’” became a term for dumping murder victims into the Pecos River, until the county was organized and law came to Pecos City. Step back into Pecos' colorful heritage as you enter the West of the Pecos Museum (the bullet hole near the door is from a long-ago gunfight). Now filled with memorabilia, mementoes, and artifacts, the three stories of rooms in the old Orient Hotel across from the railroad station served travelers until the 1950s. Exhibits show life as it was for lawman, rancher and rancher's wife, doctor, barber, schoolmarm, and saloonkeeper. the bedroom and parlor of the old bridal suite. 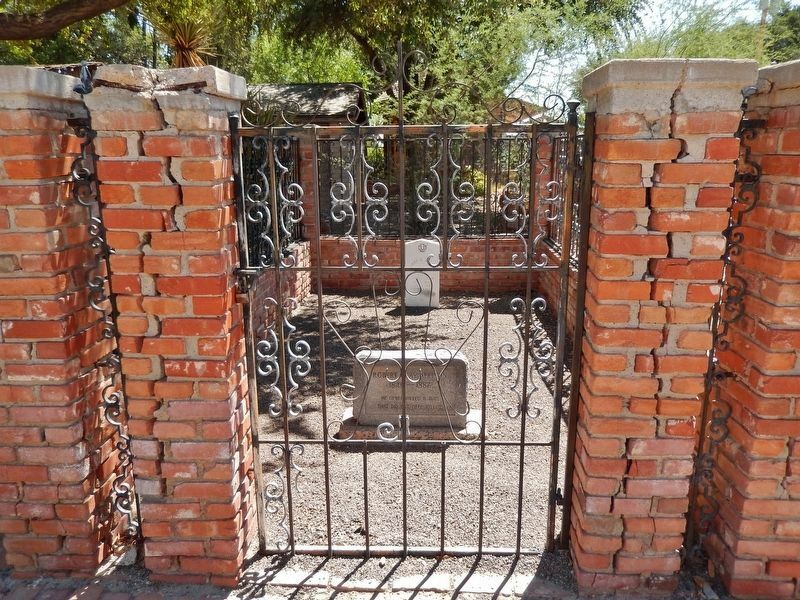 In the courtyard you'll find the old jail and hanging tree, the oldest house in Pecos, and the grave of gunfighter Clay Allison. During the cantaloupe season, visitors are served a slice of the renowned Pecos melons. Museum hours are 9-5 Monday through Saturday, 2-5 Sunday (6 p.m. closing in summer); downtown adjacent to the Chamber of Commerce (corner of first Street and Cedar - US 285). Born in Tennessee around 1840, legend says Clay Allison served the Confederacy as a spy; when captured, he escaped by slipping his unusually small hands through the manacles. 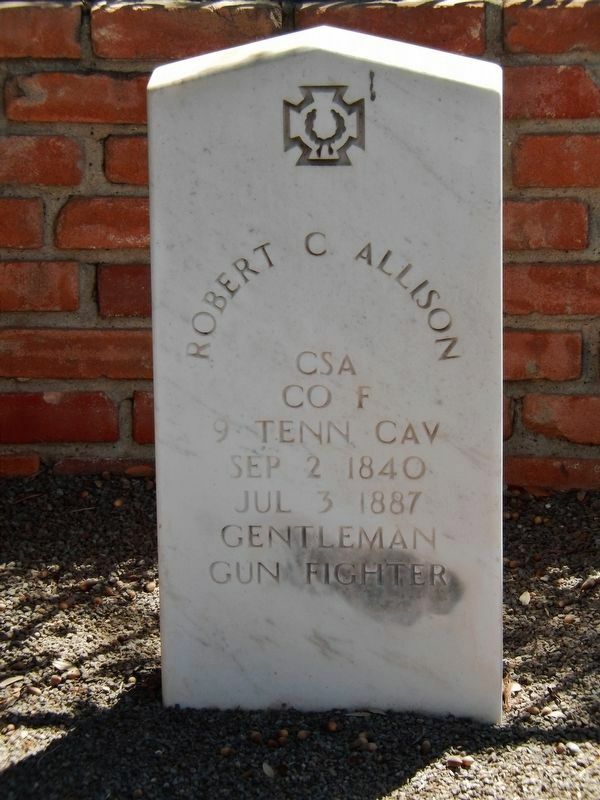 Small or not, Clay Allison's hands were adept enough with six-shooters to outdraw and kill 20 men, earning the sobriquet of the "Gentleman Gunfighter" - a title given, it was said, because "he never killed a man who didn't need killing." West of the Pecos Museum. Take more than a passing glance at the green oasis of Maxey Park along I-20 just east of the airport (hundreds of aviation cadets trained here during WWII). Yes, that really is a zebra, and there are buffalo, ostriches, and a variety of other exotic species. A favorite with visitors is the prairie dog town. There's also a botanical garden with regional flowers and shrubs, a children's miniature version of the storied Alamo, and an excellent playground. And there are picnic and overnight camping areas where visitors are welcome. Up the Pecos River is Red Bluff Lake that provides a wide variety of water sports in the arid region - fishing folk report excellent catches of white bass, hybrid striped bass, and native catfish. About 43 miles northwest by way of US 285. To the southwest is Balmorhea State Park with the fabled San Solomon Springs that flow 25 million gallons daily into the huge swimming pool (62,000 square feet). Cabins, camping and trailer sites, playground and picnic areas. Open Memorial Day to Labor Day. South on Texas 17 to the town of Balmorhea, then 4 miles southwest off US 290.
spills every 4th of July weekend. 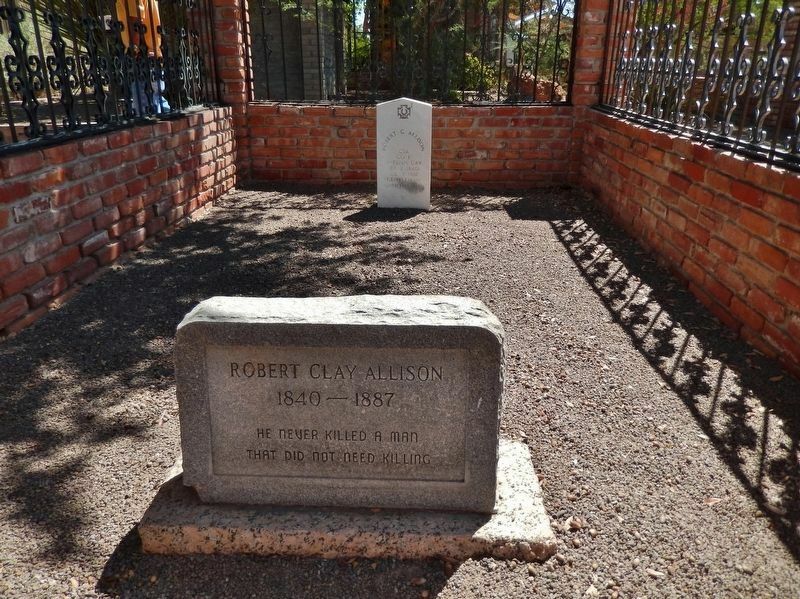 • A relic of the gunfightin’ days of the Old West is the last resting place of legendary "Gentleman Gunfighter" Clay Allison. • Step back in time and belly up to the bar at the West of the Pecos Museum, a remarkable collection of Old West memorabilia. • The ever-curious inhabitants of prairie dog town are among the variety of animals and special attractions at Maxey Park. • The vast, loamy land produces the world-renowned, luscious Pecos cantaloupes, prized by gourmets for their size and flavor. Location. 31° 25.657′ N, 103° 29.769′ W. Marker is in Pecos, Texas, in Reeves County. Marker is at the intersection of East 1st Street and South Oak Street, on the right when traveling west on East 1st Street. Touch for map. Marker is mounted in a kiosk beside the sidewalk, near the southeast corner of the Pecos Chamber of Commerce building - formerly the Pecos Railroad Depot. Marker is at or near this postal address: 100 West 1st Street, Pecos TX 79772, United States of America. Touch for directions. Other nearby markers. At least 8 other markers are within walking distance of this marker. Orient Hotel (within shouting distance of this marker); The Pecos Cantaloupe (within shouting distance of this marker); Reeves County-Pecos, Texas (within shouting distance of this marker); Spanish Explorers (within shouting distance of this marker); Mrs. Lillie W. Cole (within shouting distance of this marker); Emigrants' Crossing (within shouting distance of this marker); George R. Reeves (approx. ¼ mile away); Reeves County World War II Memorial (approx. ¼ mile away). 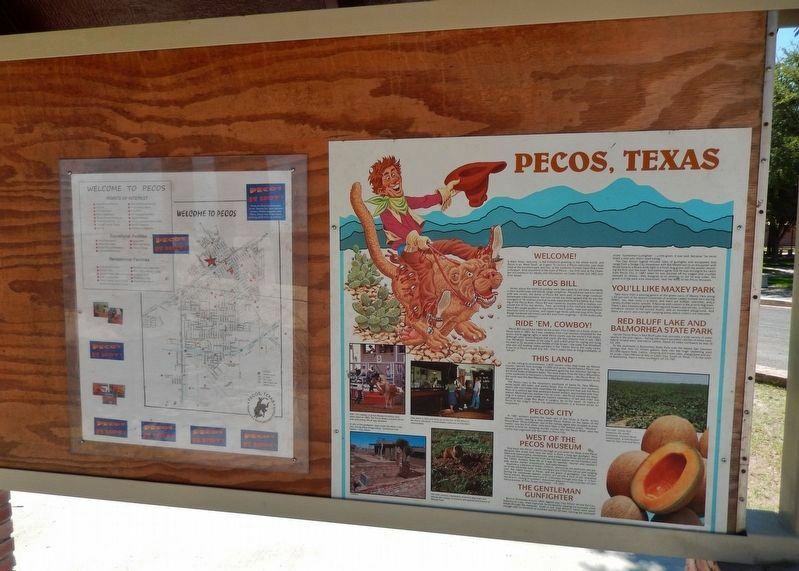 Touch for a list and map of all markers in Pecos. More. 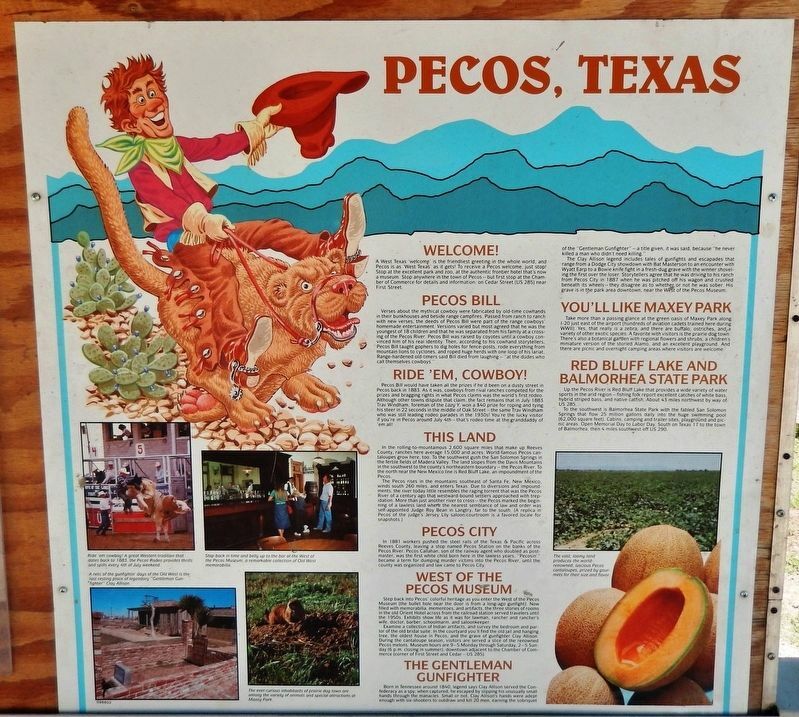 Search the internet for Pecos, Texas. Credits. This page was last revised on April 3, 2019. This page originally submitted on April 1, 2019, by Cosmos Mariner of Cape Canaveral, Florida. This page has been viewed 123 times since then. Photos: 1. submitted on April 2, 2019, by Cosmos Mariner of Cape Canaveral, Florida. 2, 3, 4, 5, 6. submitted on April 3, 2019, by Cosmos Mariner of Cape Canaveral, Florida.